What is the SPPI test? 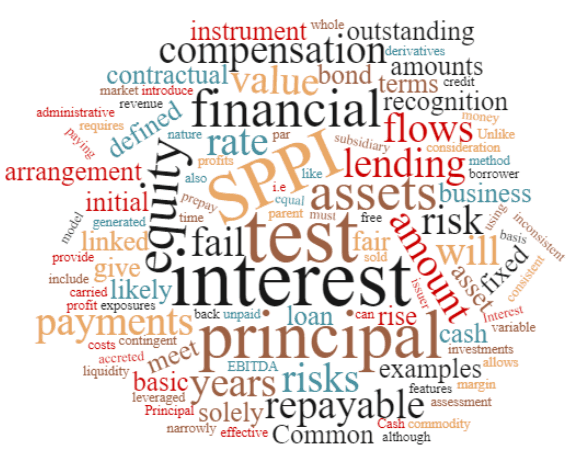 The solely payments of principal and interest (SPPI) test requires that the contractual terms of the financial asset (as a whole) give rise to cash flows that are solely payments of principal and interest on the principal amounts outstanding ie cash flows that are consistent with a basic lending arrangement. Unlike the business model test, this assessment must be carried out on an instrument by instrument basis. Principal is defined as being the fair value of the financial asset at initial recognition. Interest is defined narrowly as being compensation for the time value of money and credit risk although it can also include compensation for other lending risks such as liquidity, administrative costs and a profit margin. Cash flows that provide compensation for other risks such as equity or commodity risk will fail the SPPI test because they are inconsistent with a basic lending arrangement. Which financial assets are likely to meet the SPPI test? An interest free loan by a parent to a subsidiary that is repayable in 5 years – this is because the principal amount (i.e. fair value at initial recognition) would be accreted back to par using the effective interest rate method. Which financial assets are likely to fail the SPPI test? A bond with interest payments linked to the EBITDA or revenue of the issuer or contingent consideration linked to profits generated by a business that has been sold – this is because these features introduce exposures to equity like risks. Is the fair value option applied?